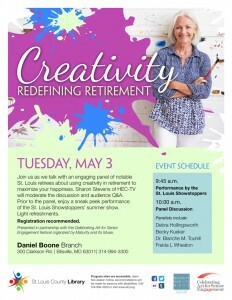 Welcome to the third edition of the Celebrating Art for Senior Engagement newsletter! This is the first area wide festival dedicated to our community’s older adult population. The festival will be from Thursday, 28th April to Sunday, 7th May 2016 and will showcase creative work, promote arts-related aging programs, feature positive images of older adults in the community, and build respect and understanding between generations. Mark your calendars the festival is starting in 30 more days! Check out our event calendar and detailed list of daily events. In this issue we will be exploring the different collaborations between groups. Thank you for your continual support! If you have any questions or comments please give us a call at (314) 420-1444. When in fact: Circus Harmony began in 1991 and is a not for profit organization. We apologize profusely! You can view the corrected newsletter here. Through these two separate interviews we explore the synergy between dance and memory. 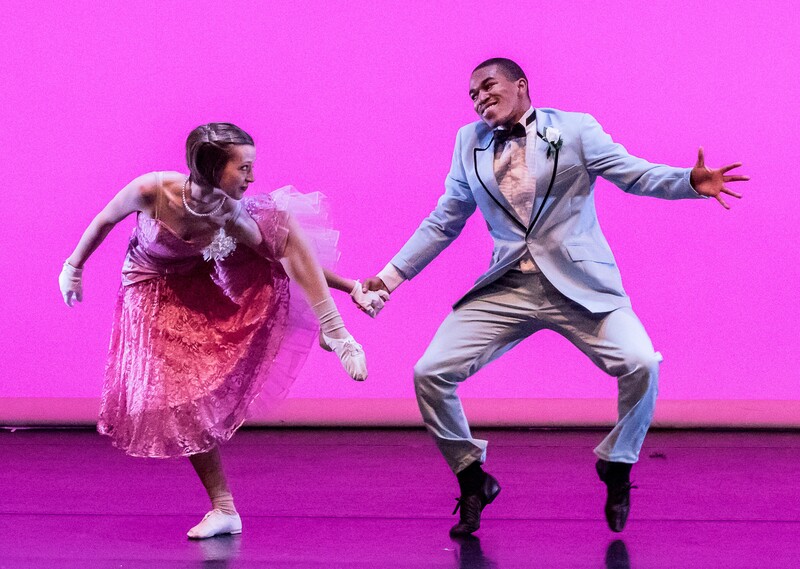 We spoke to Erin Warner Prange (E), Executive Director of The Big Muddy Dance Company, and Stephanie Rohlfs-Young (S), Vice President of Programs at the Alzheimer’s Association about the Senior Embrace Performance. How did the senior embrace outreach program come about? 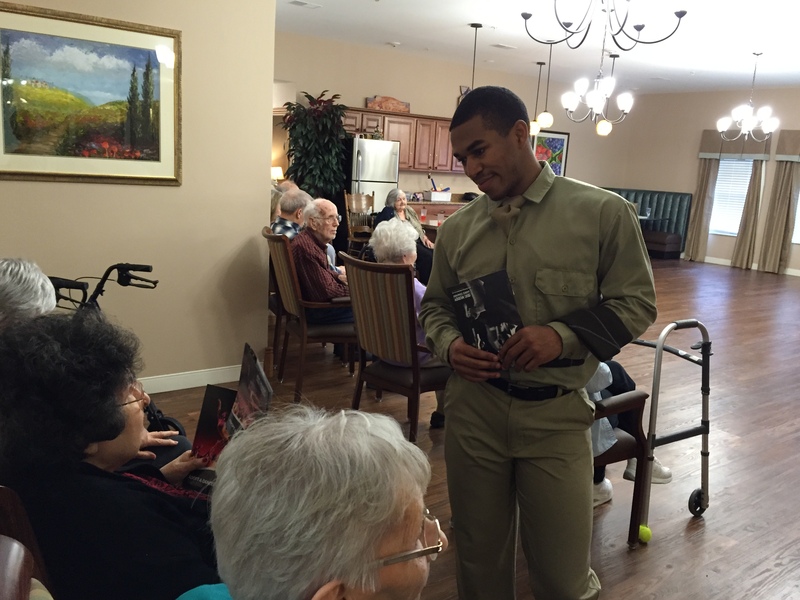 E: The Senior Embrace outreach program was started when The Big Muddy Dance Company’s founder, Paula David, arranged a visit to Tower Grove Manor in south St. Louis. The reaction of the residents was overwhelming and after several discussions about the impact of the dancing on their demeanor and ability to articulate their thoughts and memories, an outreach program was developed. 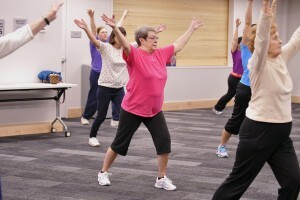 Further research showed the amazing effects that dance could have on the mind-to-body connection for dementia patients, which have become evident throughout the program’s existence. Since 2012, the company of eleven dancers has increased the number of retirement facility performances to 30 per season, and The Senior Embrace has become one of the company’s most renowned and important programs. Currently we are also developing a hands-on movement workshop for Alzheimer’s patients, which was piloted in 2013 at the Alzheimer’s Association’s Care & Conquer Conference. The workshop will be implemented at 3 facilities in the company’s 2016-17 season. 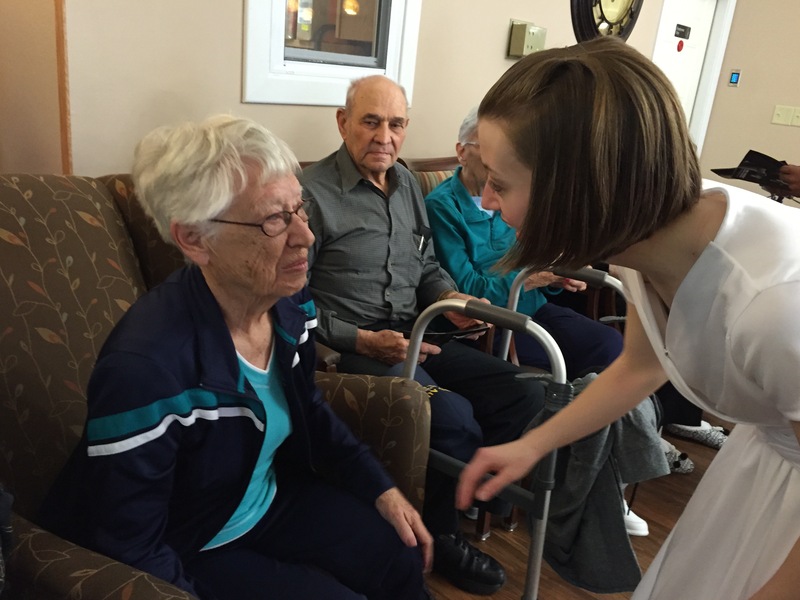 What are some of the crossovers between dance and Alzheimer’s care? E: I think the ability to express oneself through movement is as important in everyday life as it is in dance performance. The ability to read movement and physical expression is also very important. 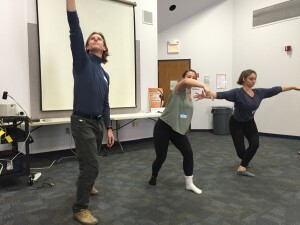 These abilities are often lost or faded during the progression of Alzheimer’s disease, and our goal as professional dancers is to use movement as a tool to reconnect our participants with familiar gestures and exercises that they perhaps have not done in many years, discuss with them the meaning of movement that they see in front of them, and work together to find musical beats and styles. These experiences not only slow the progression of dementia but also can give a new shared experience to the patients and their caregivers. S: I agree that there are many benefits of dance to people with cognitive loss. First, it’s a physical activity that boosts the blood flow to the brain and may help slow cognitive decline. But there are greater benefits in social connections and expression of artistic values. Dance has proven again and again to unify care partners and people with memory loss. What is the most significant memory you have working with someone from The Senior Embrace program (Erin) or in your work with the Alzheimer’s Association (Stephanie)? S: I’ve been working for the Alzheimer’s Association for the last 20 years and it’s really hard to single out a single story. There have been so many lives that have been touched and improved because they sought help for today and hope for tomorrow. E: My most significant memory of our Senior Embrace program was actually last fall when we completed our Route 66 tour of the program throughout 13 of the AmeriCare facilities. We met a woman named Mary about 85 years old who had moved into their facility 6 weeks earlier, and was having a very hard time adjusting to her new surroundings due to confusion, loneliness, and frustration with her lack of power about her situation. Before the performance began, the staff members did their best to calm her anxiety and keep her sitting in the area, but she was distressed. As soon as the music turned on and the performance started, she was visibly more at ease and began to smile and tap her toes. After 45 minutes of several eclectic styles of dance, Mary introduced herself to the dancers and began to recall times when she was young and went out dancing at neighboring ballrooms. As we were leaving the facility, she held my hand while crying and said, “You have no idea how much this has meant to me.” After talking with the Activities Director afterward, she said that Mary had not smiled or laughed once since arriving at the facility, and that this was the first time she had heard Mary talk about any aspect of her life. It is easy to love what we do after witnessing someone like Mary. 9370 Olive Blvd., St. Louis, MO 63132. David Marchant is a Professor of the Practice, in the Performing Arts Department at Washington University in St. Louis. What was your inspiration for the event? D: I’ve known Allison Taylor, at the Mildred Lane Kemper Museum, for a number of years and we’ve always talked about collaborating on a project together. A year and a half ago Allison and I were at a meeting at the Alzheimer’s Association about arts programming for Alzheimer’s patients. I also was involved with another project with Maturity and its Muse and the St. Louis County Library called Memory in Motion But the question of working with the Kemper and its permanent collection was always at the back of my mind. So when I heard about the festival, Allison and I began discussing possible collaborations and the Art and the Movement of Memory workshop was conceptualised. What can participants expect from the session? D: We will be asking participants to pick a work from the Kemper’s permanent collection that reminds them of a particular memory. As a person begins to tell a story their hands will begin to move as they try and paint the details about the scene they are remembering, generating a spontaneous movement vocabulary. Dancers will be watching the session and capturing these movements as someone is speaking. As we string together these different gestures to make a sort of hand dance we will ask people to do the dance together. I think we often overlook the importance of movement in our everyday lives. To be alive is essentially to move in some form, whether it’s your heart beating or walking from one place to another. What do you think is the value of translating someone’s memories into movement? D: As an artist, I believe that the mind and the body are fundamentally integrated. These memories that people are telling aren’t just twitches in the brain. They are experiences that their whole sensory body was involved in. When you use your mind and body to transport back into the moment you realise that sights, smells and sounds are inextricably linked to that memory. This can be seen in how someone begins to move, whether they are aware of it or not. When speaking about something, the body starts to relive aspects of the memory. There is even research that proves that learning and retention is improved when we have more sense modalities involved. As a non-dancer I understand movement in a very different way. What do you want your audience to take away from this process? D: I want people to be more aware of their bodies at an individual and collective level. In getting the workshop participants to share their experiences to the group we begin to form a sort of community. As everyone learns the hand choreography together we are also archiving everyone’s experience, forming a literal body of stories. Do you know what the origin of the term ‘story corps’ is? Its corporeal, which means a body. Each of us stores stories in our bodies and through sharing them with others, these stories can passed on. From offering bridge games and book signings to craft sessions and community service opportunities, the St. Louis County Library (SLCL) has engaged many residents of the St. Louis community with varied interests. 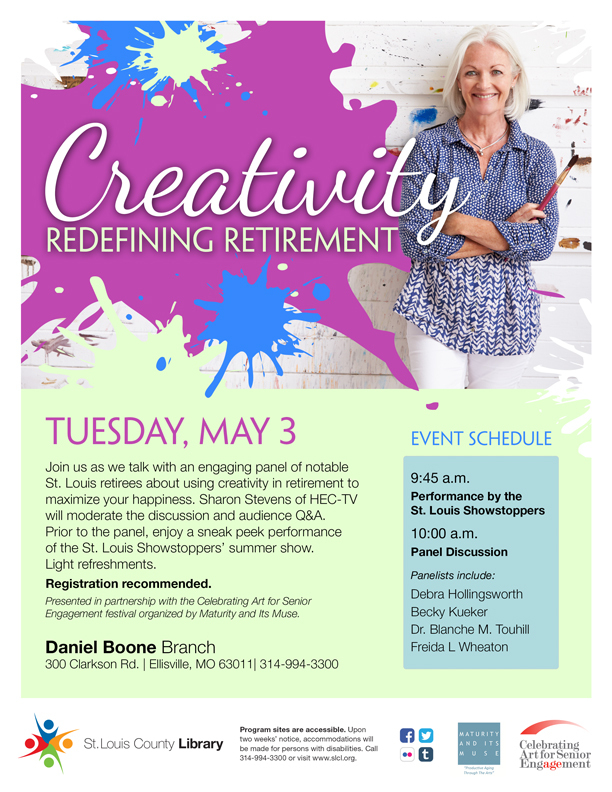 Also a long-term partner with Maturity and its Muse, we are proud to feature the SLCL’s “Creativity: Redefining Retirement Panel” in the upcoming Celebrating Art for Senior Engagement festival. In October 2015, Becky Kueker published her book “Hiding in my Pajamas.”. This candid look into the emotional journey of retirement, Becky’s personal story of embracing a new chapter of her life resonated with Stacey Lewis, Manager of Adult Programming at the St. Louis County Library, and our festival director, Lynn Hamilton. By bringing together individuals from diverse backgrounds, who have each found their own path towards a meaningful retirement, the panel will offer multiple perspectives on what to expect from life after retirement. You can expect this event to be witty, fun, engaging and meaningful. Tuesday, 3rd May at 10:00 a.m. Check out the St. Louis County Library’s other festival events here.